Standard build time for Custom “Plastic” Hub Rings is 3-5 business days. SPECIFICATIONS: Enter the outer diameter or wheel hub bore diameter. Then, enter the inner diameter or hub diameter of the vehicle. The maximum build size is 112mm and requires at least a 4mm difference between the outer and inner diameter! The minimum inner diameter that can be machined is 51mm. Not sure what size you need? Give us a call. Guaranteed to ship within 24 hours. Must meet specifications listed above. Orders placed on Friday, Saturday, and Sunday will ship on Monday. 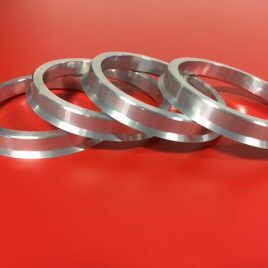 Our custom hub rings are precision machined on state of the art CNC mills. Use the Hub Centric Guide to find your vehicle hub diameter. Center bore diameters are usually printed on the box the wheels are sold in. Wheel bore size can also be sourced from manufacturer or place of purchase. For Example: Fuel Wheels & KMC Wheels provide spec sheets for all wheels.